Mystery, Knowledge, Worship : Reform worship. A couple days ago I read a post from desiringGod.org (thanks Paul) entitled "Knowledge Increases Mystery" by John Piper. Read it for yourself, but he makes two points. The first is his, and the second belongs to Jonathan Edwards: 1.) "God is more honored by worship that rises from what we know about him than by worship that rises from what we don’t know about him," and 2.) "Increased knowledge does not equal decreased mystery. It’s the other way around." I am reminded of what the Preacher says in Ecclesiastes 1:18, "He who increases knowledge [of the world] increases sorrow," because the more he knows of the world, the more meaninglessness he sees. At the same time, it can be said, as Piper says, that he who increases knowledge [of God] increases worship, because the more he knows of God, the more meaning he sees. And what is completely flabbergasting in all of this new-found meaning is that the mystery of God increases, too, as Edwards points out, which in turn causes us to fear Him and awe Him and search for more knowledge of who He is. It's a worship circle, or better yet, a spiral moving from the inside out: mystery, knowledge, worship, greater mystery, greater knowledge, greater worship, and so on. Many in the Western Church today (i.e., Western Europe, United States, etc. ), are adopting this Eastern way of thinking and living, being and doing church. It is quite popular among postmodern, post-Protestant, post-everything Christians. 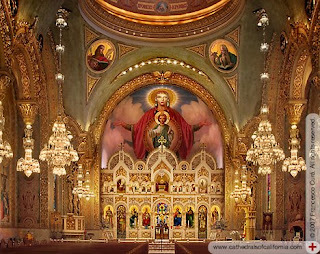 There is much to appreciate and learn from the Eastern Church, especially, in my opinion, their architecture and visual art in worship, their welcoming and joining of kingdom worship, and their high acknowledgment of the Trinity in worship. I'm afraid, however, that much Eastern worship is stuck in a different circle: mystery, worship, same mystery, same worship. Where is "the depth of the riches and wisdom and knowledge of God," as Paul speaks of in Romans 11:33? In sum, although I find value in some Eastern ways of worship - it is never good to throw out everything just because I disagree with something - I do see a danger in their overwhelmingly experiential worship, where mystery trumps knowledge. Yes, God is mysterious, but we ought to be seeking to know Him, searching his inscrutable ways, and not merely settling for mystery for mystery's sake. I'm reminded of Paul's prayer that our love would grow in knowledge and depth of insight. If God had wanted his people to live and worship in ignorance He could have just said to Abraham or Moses, "Yo! I'm God! Worship me or die!" and done something suitably scary to drive in the point. Instead He revealed His identity in His interactions with His people over a thousand years and finally appeared in Jesus and sent the Spirit who teaches and reminds and reveals and empowers His people, now sons and daughters, that they might know Him. There is the mystery that comes from not having a clue what's going on and then there's the greater and deeper mystery that comes when we come to see and understand things that cannot even be expressed. Perhaps part of the problem with EO worship is that it is based in the experiences of people who have passed into the upper levels of mystery but is presented to people who are still at the bottom of the ladder without the intermediate stage of understanding. We lazy folk think that if it's all mystery and confusion at the top of the ladder and it's all mystery and confusion at the bottom of the ladder then there's no need to climb. Now we can hide our ignorance and sloth in the vestments of mystery, take our consumible worship bits, and pretend to be reverent. Thanks for joining us and sharing your thoughts. This blog copyright © 2007 Reform worship.